Photo case study: Group work. The team look relaxed, even though we’re shooting outdoors. Perhaps the least well-understood area of corporate photography is the group shot. So often the result looks like the subjects have been forced against a wall and are about to be shot for desertion, or they’re lined up like in a wedding photo, minus the bride and groom and not even a slice of cake as an incentive to be there. There is often no thought to style, composition, lighting or location, or real idea of why the photo is needed in the first place. Just a vague notion that a group shot would be a “good idea”. Of course the alternative is to buy some random group pic off an internet photo library, but the saccharin smiles, the unrealistically beautiful people – your clients know it’s not you or your business, they’re no fools. To be fair, the corporate group photo can be quite a challenge because there are lots of busy people to bring together at one time and on one day, and in all likelihood there will be little time to take the photos, added to which; who here likes having their photo taken? No, I didn’t think so. Then there’s the lighting, location, wardrobe decisions. If not planned properly, it can all get a bit fraught. Using mobile studio lights gave the photo a more polished look. So I was pleased to get a call from a long-standing contact, Corrina Cockayne at Target Chartered Accountants in Bath, who was organising a group photo for the corporate finance team. I say pleased, because I knew Corrina would be organised and efficient and would have thought about why this team shot would be useful. In this example, it had been a while since any PR had been done and the team had evolved quite a bit. The plan was to use an outside location in Bath, and Corrina was already thinking along the right lines – considering what people would wear, what the background should be and getting in touch with the council to check for permissions etc. My job was to liaise with Corrina, talk over the options for locations and lighting, scope out the location before the shoot and be there in plenty of time to set up and take the photos before the group arrived. I wanted to keep their waiting time to a minimum. Because of the constraints of the location, I couldn’t spread people about too much or I’d risk all kinds of distractions in the background, but I knew the lighting was going to make this group shot stand out from the usual Crimewatch lineup. In the event, even though it was “just” a group shot, everyone put in a good effort and wore their best smiles, and the end result reflects the approachable professionalism of the team. 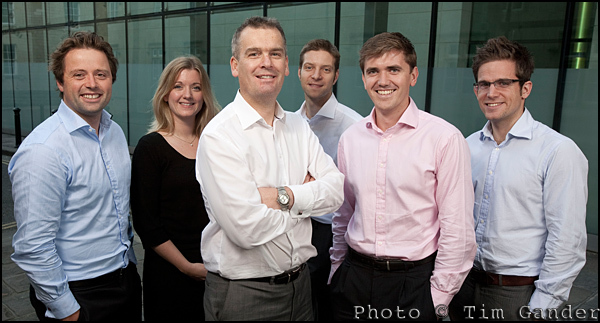 A good example of how a group shot can work and be a useful asset in the client’s photo library. Gratuitous pretty photo as metaphor for taking the long view. It’s all a bit doom and gloom in light of the latest government spending review (aka GSR, or gun shot residue since someone will have to pull the trigger), so I thought I’d offer an opinion from my own perspective as well as show you a pretty photo that might help calm the raggedy nerves. I know I’m “only” a commercial photographer, but the benefit of what I do is that I get to see inside a variety of businesses, each with their own strengths, weaknesses and difficulties to face as we all find ourselves caught between the axe man and the tax man. Of course, what is common amongst the businesses I get to visit is that they all want to update their marketing with fresh designs and imagery because not to do so is to risk becoming invisible amongst the welter of competing businesses on the web. Now I don’t want this to be yet another article extolling the virtues of online marketing. There are enough web, e-marketing and search engine optimisation gurus out there to fill the Titanic many times over, and many are about as useful as a busted lifeboat as the economy lists hard to starboard and the icy waters of recession fill the steerage class quarters and… enough of that analogy, you get the picture. The problem for businesses that need a decent website or brochure and don’t yet have them is that as we face massive public sector cuts AND the hike in VAT, the company budget will never be there to turn a poor or non-existent website or brochure into a useful marketing tool. Those businesses that have delayed too long may have to fare this storm with nothing but whatever they have right now, which might be no more than a poorly designed flyer which does nothing but demonstrate the startling array of text fonts and colours available on the MD’s nephew’s computer. Alternatively, companies can start to spend not less, but more wisely. Taking the time and effort to find the real experts in whatever needs doing. Of course I mean finding the right commercial photographer (not a mate’s wedding photographer), as well as the professional web designer, graphic designer, copy writer and marketing expert so that the resulting website, brochure or leaflet, all work much harder and have a much longer shelf life. I know this all sounds dull and isn’t producing belly laughs, but however ghastly this recession is or continues to be, one thing is certain; it will end one day, and businesses that have invested carefully in whatever areas of marketing work for them will find themselves stronger on the other side, and without Leonardo Dicaprio’s frozen, lifeless fingers still gripping whatever piece of driftwood has kept them afloat while they await rescue or the receivers. Case study: Just say cheese! 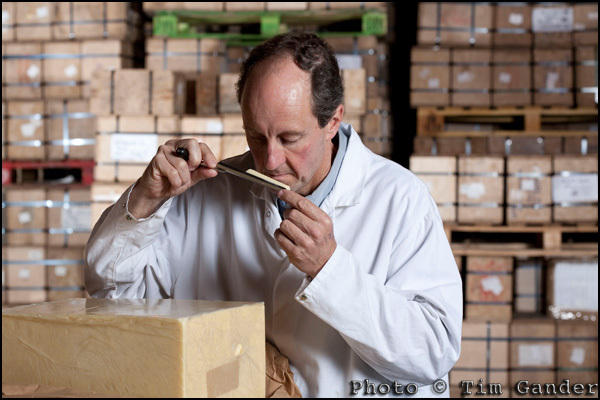 Dairy products director Simon Clapp takes a cheese sample. Mostly I use this blog to “air my views” on whatever has occurred to me that week, but this week I’d like to offer you a case study from an assignment I shot earlier this year. Corporate and commercial photography doesn’t always have to consist of serious suits looking stern, important or entrepreneurial across a boardroom table. As this set of pictures shows, sometimes I can be called upon to take pictures of a different kind of entrepreneur. It might not be obvious that that is what they are, but although the Clapp family business has been farming this site on the Somerset Levels for generations, they continue to pioneer new working methods and products while keeping their cheeses very traditional and authentic. 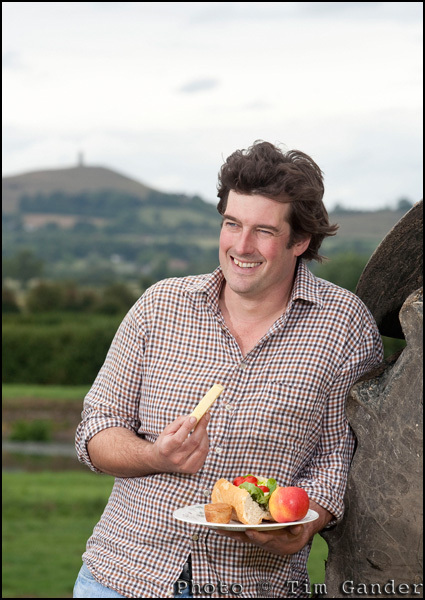 Farm and dairy herd director Rob Clapp enjoys a ploughman's with a view of Glastonbury Tor. For this shoot I was asked to produce a small set of images suitable for inclusion in food and lifestyle magazines and general press releases. The brief was to create a “hero shot” of each of three key players in the operation; the brothers who own the business and the head cheesemaker. Of course I would have happily photographed everyone involved, because in this kind of business every member of the team is vital, but we only had limited time and only so many images would get used. The purpose of the pictures wasn’t to record the daily working lives of the cheesemakers in a strictly photojournalistic way, but to represent them in more of a magazine style, where I had freedom to choose settings and use additional lighting to give the pictures a more polished look. I couldn’t have been more thrilled to work with these people. I had a warm reception from the start, a chance to watch cheese being made, and got to taste some of the most fantastic Cheddar cheese ever to pass my lips – I’m a sucker for a proper mature Cheddar, not the stuff imported from Canada which just has the word “Cheddar” written on the pack, but the kind that comes from local producers who know how it’s done. The taste is incredible as it evolves in your mouth. 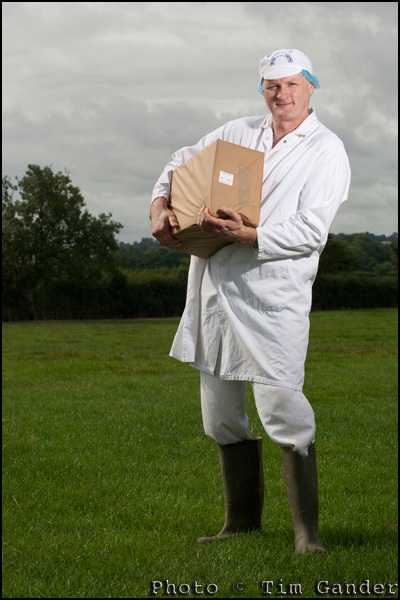 Cheesemaker Billy Melluish does well to pose holding a 20kg cheese. Anyway, back to the photography. 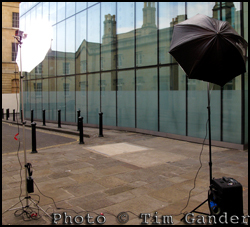 I won’t bore you with details, but in essence it involved choosing suitable locations, getting the portable lights set up and adjusted and getting the shots done as efficiently as possible so as not to disrupt the working day too much. Plus I had to work fast as the weather was threatening to turn moist so I needed to get all the outside shots done before I could turn to taking pictures in the warehouse where the cheese is matured, tested and stored until it’s ready for despatch to the shops. If you like good cheese, I strongly recommend seeking out some Brue Valley Cheddar at Marks and Spencer, or you’ll find it as Pilgrim’s Choice Farmhouse Reserve in Tesco’s. If you enjoy seeing case studies, let me know and I’ll do more. From sperm to commercial photographer. An incredible journey! Many a photographer will tell you they knew their calling right from the age they could hold a camera. Some will boast that they were checking out the possibilities of light and shade even from inside their mother’s womb. Well I can beat that; I was getting ready for the press photographer’s scrum even as I approached my mother’s egg. Ok, I exaggerate a little there. The truth is, and to cut a soul-crushingly long story short, I’d known since leaving school that I wanted to take pictures for a living, but had no idea how to proceed until someone introduced me to the picture editor at The Bath Chronicle. I may have been happiest at “The Chron”. 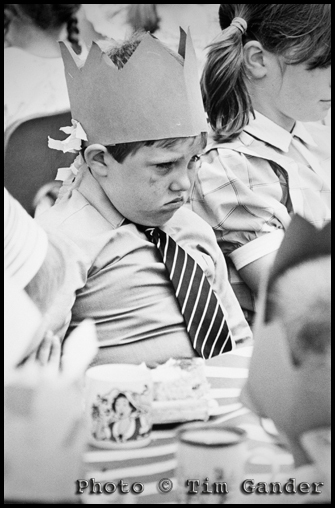 Not all my subjects felt the same way. From work experience at The Chron to trusted freelance happened pretty quickly, and hitting the FFW button again brings us to where I wanted to be – working for national titles, specifically and almost exclusively for the News of the World, where I spent the best part of two years shooting celebrity nonsense. So there I was, having dedicated a couple of years of my career almost exclusively to them, to the exclusion of my previously regular clients, and not a lot on the diary. So I picked up my book and tear sheets and started to call in at the other news and magazine picture desks. Strangely enough though, a fistful of cuttings from The Screws doesn’t exactly open doors at The Sunday Times or The Guardian. And after the constant stress and under-payment of one national, my heart wasn’t really in it any more. I could see the industry was going down the pan, and decided to turn the break into an opportunity. Of course I’ve also had to work on my business skills and adjust to the fact that I won’t get a bollocking for doing everything right. I’ve had to break the instinct to shoot all my pictures from behind a bush in the car park (I’ve found that tends to unnerve some people). But I do enjoy being given some creative freedom, being asked for picture ideas and not having to pee into a bottle in the back of a surveillance van. I do miss press work sometimes though. When I see a big story break, I might wish I was there to cover it, but apart from the occasional magazine commission, I don’t work directly for newspapers any more. Taking into account all the costs of being equipped to do the job and running a professional service, the fees offered by the press mean they’ll be drawing on an ever dwindling number of professionals who can still afford the cost of working for them. I’ve grown up and moved on to where I can be of most use, and still make a living. This article is soon to be a film starring Jim Broadbent and Matt Damon. If Matt can fit into the sperm suit.